(CNN) -- A smudged fingerprint has convinced art experts that a painting thought to have dated back to the early 19th century is the work of revered Italian artist Leonardo da Vinci. 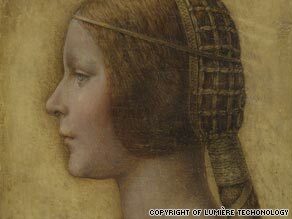 Da Vinci expert Martin Kemp has renamed the work, "La Bella Principessa" after the young lady in the portrait. Little is known of the painting before it appeared in an illustrated Christie's catalogue in the late 1990s labeled as "German, 19th Century" under the name of "Young Girl in Profile in Renaissance Dress." It sold for $19,000 at the auction to respected New York art dealer Kate Ganz who kept it for 12 years before selling it on for a similar price in 2007. The work is now locked in a Swiss bank vault with an estimated value of more than $160 million. Peter Silverman had seen the work during the original auction back in the 1990s. "I was actually an under-bidder because I thought it was a wonderful thing but I didn't have the knowledge at that time to go all the way," he told CNN. More than 10 years later, he was walking in New York with a Swiss friend whom he describes as a "major collector of contemporary art." "He popped into the Ganz gallery and saw this thing on her desk which was for sale. And he came out and said, 'Peter I don't know what I'm looking at here; I'm a contemporary collector. But I certainly would like you to have a look at it because it doesn't look 19th Century to me.' So I went and looked at it and I bought it right way for him." Silverman then began the long process of proving that every expert and art lover who had seen the painting over the past decade -- and earlier -- had been wrong to assume that it was the work of anyone other than one of the world's greatest artists. "I kept saying to myself, this is absurd, it can't be," Silverman told CNN. "A da Vinci coming out of the woodwork, just like that, nobody recognized it, fully illustrated, seen by the whole world at Christies, in the hands of one of the top dealers in the world. I was puzzled, sort of stymied." He started researching followers of da Vinci who may have produced the work in their mentor's style, but kept coming back to the same conclusion: That it was a da Vinci. "My one claim to fame in this whole thing is that I saved it from obscurity," Silverman told CNN. In January 2008, Silverman bumped into Nicholas Turner, former Keeper of Prints and Drawings at the British Museum, at an exhibition at the Louvre in Paris. He showed Turner an image of the print on a digital camera who agreed it looked like a da Vinci. Other experts agreed but it was evidence from the Paris-based firm Lumière Technology that Silverman says was "the icing on the cake." Last June, using a "multispectral" digital technology it pioneered, the firm took images of the layers of pigments used to create the work. Within the pigment, they found a partial hand print and a finger print which matched others found on two known works of da Vinci. "To capture it took less than two hours, after that we had to study more than 20 gigabytes of data," Jean Penicaut, CEO of Lumière Technology told CNN. Da Vinci scholar Martin Kemp, Emeritus Professor of the History of Art at Oxford University, was called to lend his expertise and also concluded it was a da Vinci. He has just finished writing a 200-page book on the work which is expected to be published later this year. Professor Kemp told the Antiques Trade Gazette that his first reaction to the find was that "it all sounded too good to be true -- after 40 years in the Leonardo business, I thought I'd seen it all!" Kemp told the gazette that the portrait must date from around 1496. He believes it is of Bianca Sforza, daughter of Ludovico Sforza, Duke of Milan and his mistress Bernardina de Corradis. He has renamed her portrait, "La Bella Principessa." In addition to the left-handed print, Kemp used extensive research to conclude that the work, da Vinci's only on vellum (mammal skin), was created as a cover of a book of poetry in honor of the sitter. "All the information that Martin Kemp has discovered about it; the lefthandedness, the quality of the work, the fact that it's on vellum and was meant for a book. There are many different aspect which together make it a Leonardo," Silverman said. But he added, "if it hadn't been for all these technological advances and these great people working with me on this it still would be in limbo." The portrait is due to on display in Sweden next March at a show called "And There Was Light: The Masters of the Renaissance Seen in a New Light" to be held in Gothenburg.